DP Ultra is the result of extensive testing and contains multiple specially selected components which offer optimal protection from corrosion and also allow maximum cooling performance. The coolant is manufactured following the highest quality standards and using only the best and most pure contents - completely made in Germany. DP Ultra was specially designed for PC cooling applications with systems containing both copper and Aluminium components. The electrical conductivity was reduced to a minimum. The contents also reduce foam build-up and optimize the heat transfer by featuring optimal flow properties. The combination of these specially designed features allow maximum cooling performance and longevity for your system. 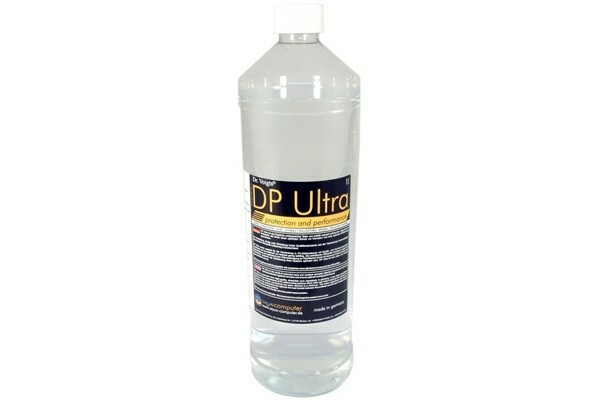 DP Ultra is a clear and almost completely odour-free liquid. DP Ultra was designed by aquacomputer in cooperation with Dr. Tobias Voigt. DP Ultra achieves great cooling performance compared to other offered ready-to-use coolants and improves on flow properties with its unique contents. DP Ultra can be filled into the system as-is. We recommend a yearly replacement of coolant. 2 Вопрос (ы) на других языках. Нажмите здесь, чтобы отобразить этот вопрос (ы). Hallo, kann man diese Produkt läger lagern oder hat es ein Verfallsdatum? Dieses Produkt hat kein Verfallsdatum aber man muss beachten das man das Produkt in einem Temperaturrahmen von 0-30 Grad lagert. Welche Farbzusätze kann ich bei dieser Flüssigkeit anwenden? Hätte gerne weiß.